Who is the weirdest writer? Obviously that’s a huge question, and the answer will be contingent on both your definition of the word and the scope of who you’re reading. There are probably more than a few unpleasantly strange or shockingly bizarre authors writing fiction right now, though mainstream publishing seems to do a pretty good job of shutting them out for popular audiences. But if you were looking for an author who managed to squeeze in for a while and who isn’t so much macabre or grotesque (though he is certainly that more than occasionally) and rather more like just wonderfully, rollickingly weird, you wouldn’t have to look farther than R. A. Lafferty. Lafferty is a puzzle, and I’ve written about him on the blog several times before without getting into much deeper analysis. (If you want deeper analysis, check out Feast of Laughter.) I keep writing reviews about him as though I’m writing for an audience that’s never read him. That’s okay though, because that audience is still far too large, and Lafferty seems to bring out the evangelizing tendencies of his readers. Lafferty’s work– which flourished in scifi and fantasy magazines at the weird height of the New Wave– doesn’t so much straddle all the borders of speculative fiction (horror to fantasy to weird western to science fiction) so much as it seems blissfully unaware that such borders exist. His stories are tall tales, whether set in outer space, the far future, or the living room. They create lumbering, larger-than-life characters with a language more akin to a Native American story-teller (which is why his work does so well read aloud) than prose satisfied with sitting quietly on the page. So what does one find in this second volume? For one thing, don’t worry if it’s the only volume you can find, as the stories appear in these collections in no particular order or chronological progression. This volume (like the first) is a grab bag so that, as the editor explains, a reader new to Lafferty can experience him as readers in the sixties, seventies, and eighties did: a large, bright voice stumbled upon in stories scattered through magazines and collections of the decades in no apparent order. What about the stories themselves? What does one stumble upon in this collection? Wide open vistas. And jokes. In fact, looking down the list of the table of contents for this volume, I’m struck that this might be a common theme here. Not that these stories aren’t serious or well-written, but rather that each of them (or at least most of them) contain a central hidden hook, something that you only catch looking at you and winking when the story has wrapped up. I can’t tell you the punchline for each story (and in at least one of them I simply didn’t get the joke) but I’ll highlight a few of my favorites. “Land of the Great Horses” is a good place to start. It’s a mosaic tale, told from a variety of perspectives, including a fictional encyclopedia article, about the reappearance of the lost homeland of the Romany, shot through with Lafferty’s celebration of language. Then there’s “Ride a Tin Can,” which combines music with folk anthropology to give a tragic, grotesque, and hilarious first contact story against the background of economic exploitation in the worse sense possible. Another favorite in this collection is “Hog-belly Honey,” which illustrates Lafferty’s unique ability to combine aspects of hard science fiction with a homespun, raggedy narrative voice and give it all the feel of genuine folk medicine and showmanship. Finally, I loved the piece “Great Day in the Morning,” which pokes fun at some of the assumptions of the modernist paradise but doesn’t flinch to go all the way and take such assumptions to their ludicrous conclusions. I saw a spectacularly disheartening graphic the other day that proposed to break the art of the story down to its component pieces, outlining the different types of general characters and plots and settings like you’d pick them off a menu and use to build your own narrative value meal. The graphic also reminded helpfully of the basic narrative arch: the character experiences conflict or a problem, this conflict goes through climax and resolution, and then the story ends with the character changed in important ways. This is all useful enough, but Lafferty is the sort of writer who reminds that to do really interesting things it’s better to just ignore helpful narrative flowcharts altogether. Or rather, Lafferty turns the narrative flowchart on his head, because it’s not his characters experiencing this arch– it’s his readers. You start a Lafferty story and immediately realize something is off or strange. This isn’t the world you were expecting. The sense of uncertainty grows as you read it, but you’re drawn along by his voice. And then at some point you abruptly get it: the concept or the punchline or the up-side-down world snaps into focus and the reader (never mind the main character, who might well be dead, dismembered, or eaten at this point) leaves the page changed in important ways. Yet even that approach is a model Lafferty can discard whenever he sees fit. Some of the stories are simply straightforward and lovely, like the pseudo-biographical piece, “Gray Ghost: A Reminiscence,” which is in the strain of the very best Bradbury. Another, the final in this volume, is a post-apocalyptic tale that may be Lafferty’s world building at the most compelling I’ve seen. In the space of a short story he spins out a tiny kingdom, characters, and ecological tangles that seem in some respects as contemporary as The Hunger Games and as haunting as Nausicaa of the Valley of Wind. I continually find when I reach the end of reviewing a book by Lafferty that I haven’t really done it justice. Well, then you read some of his stuff and try to explain it. Or rather, imagine this. Imagine a man who no longer exists, maybe your great-grandfather or maybe the person you always hoped your great-grandfather was. Someone a little strange but who has been places you never have (because most of them no longer exist either) and who tells spinning, staggering stories with the voice of an older generation. Someone who has one foot in the American West with its tall tales and the other in the technology that was sprouting like mushrooms at the height of the Space Race. And this man tells stories, and no one ever told him how he was supposed to tell them, so he tells them like he wants. There you go. Lafferty is a little bit like that imaginary man, raised to the third power, at least. This entry was posted in Reviews and tagged Americana, Centipede Press, fantasy, fiction, Lafferty, R. A. Lafferty, reviews, science fiction, speculative fiction, tall tales, weird, weird western on August 23, 2016 by boldsaintcroix. There’s something a bit strange about only children. Maybe it’s not polite to point it out, but not having siblings seems to leave one without context and make one a little bit more difficult to relate to. That’s what I felt with Norstrilia, the only completed novel of Paul Linebarger, a diplomat, foreign operative, and expert on psychological warfare who wrote and published science fiction under the moniker of Cordwainer Smith. Norstrilia is a strange only child. Not only was it strange in content and tone, it was a bit awkward in form. The work was published originally as two separate pieces (serialized?) in magazines. It was only stitched together into a whole narrative later. And this particular work was compiled by a specialty press and included all the textual variations in an appendix at the end. Why do I get suspicious with textual variations? An author is never sure exactly what to say or how to say it, but usually they manage to hide this uncertainty. I suppose I don’t like the reminder of having it made manifest. That all probably sounds like complaining, but I enjoyed reading Norstrilia quite a bit. I think I was prepared for it because even though it doesn’t have any siblings, it does have some cousins: those strange half-breeds and vagabonds that are the fiction of R. A. Lafferty. Norstrilia wasn’t a Lafferty, but it had several similar features: the strange, rollicking pace; the larger-than-life characters; the comfort with the bizarre; and the lack of emphasis on a tight, cogent plot. So here’s what it’s about: in the far future there’s a planet called Norstrilia (a contraction of “North Australia”) that grows a viral serum that ensures long life for the rest of the galaxy and makes Norstrilia incredible rich by its export. (Think Arrakis with giant mutant sheep.) The planet is the epitome of the hardy, frontier lifestyle that Smith saw in his own time in Australia, and to preserve this way of life (as well as population control), Norstrilia has kept itself poor on purpose– even though most of its inhabitants are fabulously wealthy. One of the ways they do this is by making imports to the world incredibly expensive. The other is a test at the age of adulthood to determine whether the Norstrilian youth will receive full legal status or be killed (think the gom jabbar, also from Dune). Against this weird background one Norstrilian grows up handicap, unable to telepathically spiek or hier like his peers. He uses a forbidden computer to play the markets and more or less by accident becomes the wealthiest man in the universe, and he buys the Earth. Traveling to Earth, he’s manipulated by various agencies– including Cordwainer’s famous Instrumentality of Man, the animal-engineered servants of humanity, and a mysterious agency living beneath the surface of the planet. Along the way a lot of things happen, with wild, lazy, larger-than-life brushstrokes that remind of Lafferty. There’s a lot of bigness and beauty here, shot through with much weirdness. I don’t know if I would have appreciated it as much had I not already read things along these lines– again, had I not been inoculated, so to speak, by Lafferty. I don’t know if this means Lafferty is a gateway drug, but he certain helped. There are rambles here, large figments of imagination floating like icebergs in a froth of Silver Age science fiction, and meanderings enough to annoy someone used to the clipped, brisk pace of contemporary scifi. But there is kindness as well. When a friend recommended this book, he said he thought kindness was a theme of Smith’s work. I see what he means, though the turn is abrupt and inexplicable halfway through the novel. The main character has a crisis of faith– mitigated by a psychological hall of horrors akin to the trial that started the narrative– from which he emerges with a sense of humility, gratitude, and benevolence. He is filled with pity for the erstwhile enemy that instigated his banishment from Norstrilia (though the denouement with this character is quite weak). From what I’ve read, Smith’s high church Anglicanism shaped his writing here in some respects. In all, this was a book I enjoyed reading for its comfort with the bizarre and its quirks, but I’m not sure how strongly I’d recommend it to readers at large. I could see it being a bit impenetrable. But if you’ve cut your teeth on someone like Lafferty or even the meandering far futures of Gene Wolfe’s New Sun, you might give Smith a try. This entry was posted in Reviews and tagged Cordwainer Smith, Gene Wolfe, Lafferty, Norstrilia, reviews, science fiction on September 29, 2015 by boldsaintcroix. Fanzines are a new thing for me. But when I was approached about one of the reviews I published here about Lafferty’s collection Strange Doings appearing in the Lafferty fanzine Feast of Laughter, I was happy to oblige. And then when the editor asked whether I had any Laffertesque pieces of fiction that might fit its remit as well, I was even happier. 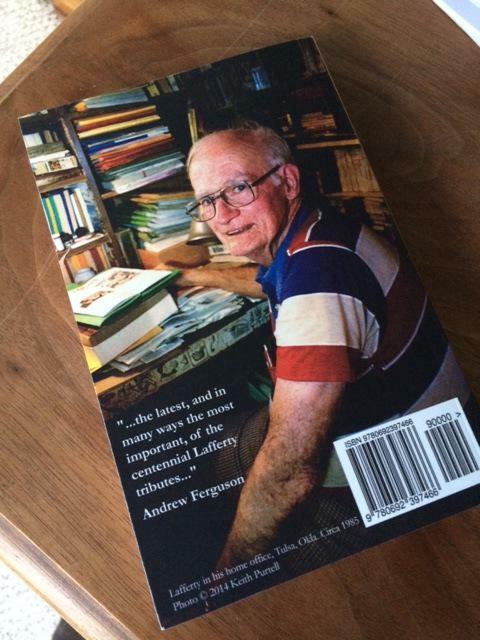 Which is how a contributor’s copy of volume 2 of Feast, “An Appreciation of R. A. Lafferty,” appeared in my mailbox. And what a fanzine! Feast, which I read from cover to cover is indeed just that: a veritable feast for anyone interested in Lafferty or his works. The table is set equisitely: the magazine is well put together, with a gorgeous cover (which I’ve admired but only just realized the creepy details from the story it illustrates depicted), perfect-bound, nearly 300 pages. As lovely as the front cover is, the back is even cooler: an office cameo of everyone’s hero himself. The only way this magazine could physically be better would be if it came with a tiny duplicate of the legendary Lafferty office door itself. So what are the courses of the feast? First we have essays. Besides Daniel Otto Jack Peterson, I wasn’t familiar with any of the authors. Some of the essays were compelling, especially those that dove into the allegory and Catholic context of Lafferty’s work. A few were as obscure as some of Lafferty’s own difficult work. In particular, I found Persaud’s “Question: Why? Excuse: Because Monsters” montage a bit inscrutable. The second course consists of articles regarding Lafferty fandom around the world, particularly in Japan and Russia. The Japanese article was especially useful, as it opened a door into a world of Japanese science fiction with a list of recommended works by Japanese readers who love Lafferty. With Lafferty as a common denominator, this could be a powerful window into exploring the speculative literature of another culture, something that’s always daunting to know how to begin. Then we get an interview with an early and important Lafferty fan, followed by a section of reprinted essays by greats such as Michael Swanwick. I was a bit lost in the contributions by Knight and Sirignano, which attempted to explain the labyrinth that is Lafferty’s Melchizedek saga, but this will likely be an important resource for someone who has read that work and is interested in deciphering its puzzles.Then come the reviews, and I was by this time so immersed in the meal that I had the simultaneously pleasant and disconcerting experience of turning a page and being surprised to see my own name, having forgotten for a moment that the whole reason I had been invited to this feast was because I had prepared a small dish. The penultimate course is the Lafferty-inspired pieces, which consist primarily of poetry, though I have a story sandwiched pleasantly between a cozily-gruesome little piece by Daniel Peterson and a haunting story by Howard Waldrop and Steven Utley (yes, that Howard Waldrop, the one who wrote “The Ugly Chickens”). My piece is “What I Wrote for Andronicus,” which was originally published in Ideomancer in 2010. 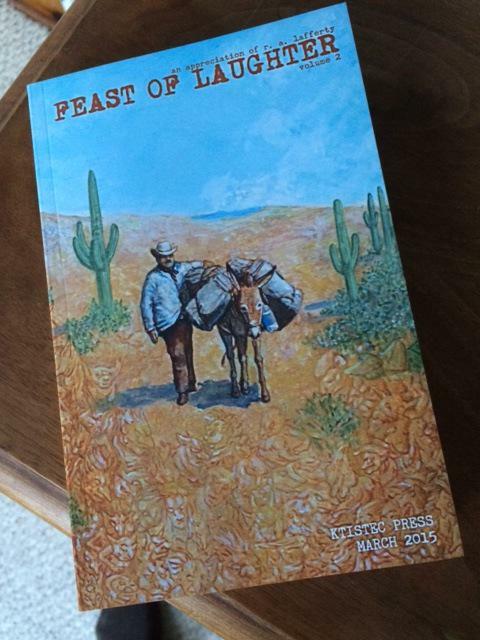 The meal ends with dessert: a reprinted interview with Lafferty himself and a reprint of one of his best known stories, “Sodom and Gomorrah, Texas,” which is illustrated by the fantastic artwork on the volume’s cover. Then the plates are cleared away. The feast is over. But we’ll gather here again soon. Roll on, volume three. This entry was posted in Reviews and tagged Catholicism, collections, fanzine, Feast of Laughter, Lafferty, R. A. Lafferty, science fantasy, science fiction, writing on June 9, 2015 by boldsaintcroix. Gene Wolfe has said of writing short stories that it is not enough to simply show people your ideas. He uses the analogy of a lion-tamer. A writer can’t just say to people, “Hey, look at this lion” and expect them to be impressed with her skills at showing them a lion. A writer has to do something with the lion, preferably something daring and unexpected. Wolfe says that the writer has to put her head in the idea’s mouth. For me, that is the most difficult part of writing. Often I simply want to show people my ideas– an interesting imaginary place, for instance, or a character or device or image– but finding that narrative twist and plunge that makes the idea spark and come alive as a leaping, writhing story is something very different. As important as Wolfe’s advice is though, I don’t feel like his requirement applies to R. A. Lafferty. There are in his stories– and specifically in the stories of this volume– rarely those unexpected twists that make you feel as though the bottom has fallen out of the narrative. In many of the stories that make up this collection, a reader can feel the end coming, can get a sense for the ultimate trajectory of the story, within the first few paragraphs. Part of this is because Lafferty does not craft those literary artifacts called short stories. Instead, he tells fables, and most fables have been told in some form before. But I think there’s also something deeper going on here with Lafferty and Wolfe’s lion-tamer analogy. To return to Wolfe’s image, Lafferty does not need to stick his head in the idea’s mouth. Lafferty is the lion-tamer, but he’s a lion-tamer saying, “My God, it’s a lion. No, you haven’t ever really looked at a lion before. And you haven’t seen a lion like this. Look at it. This is the lionest lion that ever lived; this is the Ur-lion.” And then the lion– which, you realize, is indeed wilder and more savage and yet more merry than any lion you’ve seen before– rips out the lion-tamer’s throat and eats it with a wet chuckle, and both lion and lion-tamer have a good laugh together because that’s what lions are and that’s what lions do. The story “Golden Trabant” in this volume is a good example of this approach. Narratively, the story is incredibly simple and has indeed been told many times before: a man discovers the El Dorado of asteroids, a rock not far from Earth formed completely of gold. What happens next? Exactly what you would expect. Pirates lay claim to it and become fabulously rich. Earth’s economy becomes unbalanced by the sudden influx of off-planet gold. The pirates build a kingdom with their new gold, sail the high skies hauling back their treasure in ship-loads, and ultimately turn each other. The asteroid becomes an irradiated waste haunted by a ghost. It’s every lost treasure story you’ve heard before with only the (now-blasé) element of being set in space. Maybe that was a new wrinkle when Lafferty wrote it, but beyond that there’s no unexpected twist that makes the story leap up out of the page like a living thing. And yet it’s a fantastic story. Like so many of Lafferty’s, it simply works. The whole thing is alive. This is the case with many of the stories here. In some, it’s unclear what exactly is happening or has happened, plot-wise. “About a Secret Crocodile,” “Nor Limestone Islands,” and “Boomer Flats” are examples of this. “Boomer Flats” and “Maybe Jones in the City” in particular I found a bit frustrating, but the richness and jollity of Lafferty’s tone always wins me over eventually, even when they seem spun around nothing. If the bones of the story are a bit hollow, you still get Lafferty telling them. And that’s what you want. I’m convinced that had Lafferty taken it upon himself to re-write a phone book, it would be fun to read. An annoying and puzzling (though easily ignored) feature of this volume is the needless division of the stories into those related to “Secret Places” and those about “Mean Men.” The stories in this work alternate back and forth between these two headings. In my edition of the book, this is even reflected by stories under each division having a differentiating font. Lafferty (not surprisingly) offers no explanation for this division, but it’s unlike Lafferty to offer much explanation for anything. The reason the division doesn’t work though– or at least seems unnecessary and arbitrary– is that all of Lafferty’s stories are in some sense about secret places, and they’re all in some sense about mean men. They’re stories about the hidden, real world lurking just below the skin of this one and about the god or the devil lurking just below our own skins. That’s why their twists aren’t wholly unexpected: we feel them in our bones. We catch hints of them when we we’re not asleep. If you’re new to Lafferty, this is as good a place to start with him as any. It’s hard to know what angle to approach his writings, but wading out into his short stories and learning how they rise and fall is easier than diving into one of his novels. Because, to be fair, you might not like his bright and bloody world. You might not want to get too close to that lionest of lions and hear its throaty chuckle. With his short stories, it’s easier to run away. This entry was posted in Reviews and tagged anthology, fantasy, Gene Wolfe, Lafferty, R. A. Lafferty, reviews, science fiction, short stories, writing on December 23, 2014 by boldsaintcroix.